We are huge advocates of environmental protection and it shows in the way we do business every day. As a metal recycler, we keep millions of pounds of metal out of landfills and prevent mining for new metals. So when you bring your metal to us, you have a big impact on the environment. Even the way we recycle metal is better for the environment. We’ve invested in an eco-friendly shredder that is electric powered and water cooled. It has no negative effect on the environment! We also are reducing our carbon footprint with rooftop solar panels which have already offset 816,147 lbs of CO2 since installation. This year, the world’s larger environmental movement, Earth Day April 22, is focused on ending plastic pollution. 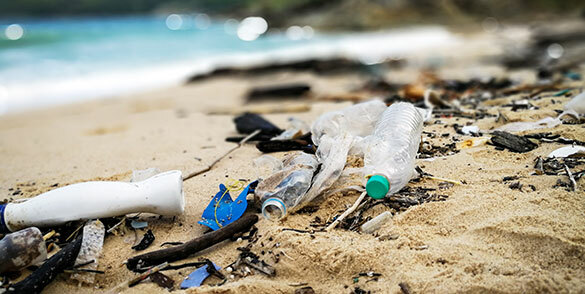 Just as we aim to keep metal from ending up in landfills, we can all do our part to keep plastic from polluting our planet, especially our beaches and oceans. Many of us don’t realize the harmful impact plastic has when it is thrown away. It actually doesn’t go away! Of course, plastic has huge benefits in that it is light, strong, inexpensive, long lasting and sterile. However, because plastic has become a dispensable product, our addiction to its convenience has big consequences when not properly recycled or reused. Startling fact: Most of the plastic that has been made is no longer in use. About 6.3 billion metric tons of plastic has been thrown away since 1950! And only about 12% of that has been incinerated, which is the only way to permanently dispose of plastic. 9% has been recycled, and the remaining 60% resides in landfills or scattered in the environment. This has a large negative impact on not only the climate, but our own health and that of marine life. Just how bad is plastic to the environment? Because plastic never fully degrades, over time it breaks down into smaller and smaller pieces which end up in the bloodstream of marine organisms. This is only one example of its detrimental effect on the health of our planet, but the consequences to human health are just as much a concern. Many plastics contain phthalates (DEHP) and the chemical bisphenol (BPA), which are a hazard to the human body including health risks related to hormones and our reproductive systems. With such a huge problem to face, how do we fix it and prevent future pollution? It all comes down to the choices we make as a consumer and being proactive in education and litter clean ups. The normal recycling ‘Reduce, Reuse, Recycle’ campaign applies to plastics, but with the additional steps to ‘Refuse’ and ‘Remove’ plastic from our environment. There are numerous local organizations that coordinate clean ups in our waterways and landscapes. Follow some of these local groups to volunteer: Surfrider.org, epa.gov, keepncbeautiful.org, and ctnc.org. Imagine the change we can make if we all start applying these steps to our daily lives. Let’s do this and put an end to plastic pollution!